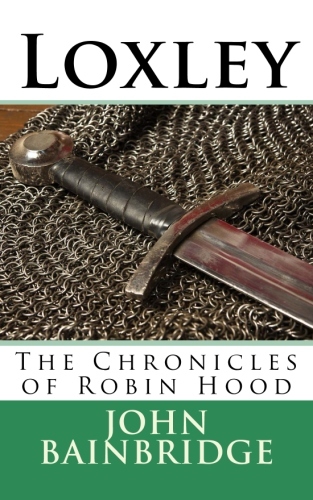 My new historical novel “Loxley – The Chronicles of Robin Hood” is now available in paperback and as an eBook (click on the link below for more details). I end my book with an essay on the origins of the Robin Hood legend. A longer version appears at the end of the novel, but here’s a few essential points. So did Robin Hood actually exist? And if so where and when? In a way it doesn’t matter if there was an historical Robin or not. He exists in the minds of billions of people around the world. He is, to employ an over-used phrase, a cultural icon. The outlaw in the forest. A fugitive from injustice. The rebel who fights the wealthy and powerful. Robs from the rich and gives to the poor. In Britain today we even have a “Robin Hood Tax Campaign” which seeks to even up the balance between the haves and the have-nots. Just say the words “Robin Hood” to virtually anyone in the world and they’ll know who you mean. An image of the outlaw will have appeared in their mind. Not bad for someone who – if he lived at all – probably started out as an English (and very localised English) rural bandit! And go to many parts of Britain and you’ll find quite a supply of Robin Hood’s graves, wells, caves, larders, and so forth. Yorkshire has a village named after him, Robin Hood’s Bay. There’s even a Robin Hood International Airport near to Doncaster! And it’s not just the outlaw chief. The last resting place of Little John may be seen near to his old home town of Hathersage. Friar Tuck and several of the other merry (or, often, not so merry) men can boast local connections. Much of the tourism industry in Nottinghamshire depends on Robin Hood. He has a statue outside Nottingham Castle. He’s well featured in the Sherwood Forest Visitors’ Centre. You can even glimpse men dressed up as him in Sherwood Forest. Robin Hood is an attractive figure even in our own troublous times, when the wealthy and powerful seem to have scant regard for the struggles of the less fortunate. He is the most potent symbol in our culture of the idea of Right fighting Might. If that sounds very political it is. Can there be any grander political ideal than upsetting the status quo and battling for equality? Alongside the legend of King Arthur, Robin Hood is one of the two essential English myths. Someone we’ve all grown up with, in novels, television series and numerous films. If there was an actual individual who inspired these yarns he’d probably be amazed at his legacy. So what do we know about the beginnings of the Robin Hood legend? The answer is precious little. There are a small number of old ballads relating the deeds of the outlaw. Just five of them of reasonable vintage, and a tiny portion of an old play. The oldest extant ballad probably appeared only in the fourteenth-century. There is a mention of the wolfshead in Langland’s Piers Plowman, probably from around 1377 – the earliest mention of Robin in literature. Troubling for those of us who love the outlaw, the Robin Hood in these ballads is not quite the freedom-fighter of our imagination. He and his men are portrayed as rather less generous and rather more as bloodthirsty villains. Killing and mutilation are their stock-in-trade. Furthermore, the setting is not usually Sherwood Forest, and the king of the time is named Edward rather than the Richard the Lionheart of so many books and films. The suggestion is that the Edward in question is perhaps Edward II. Some of the popular characters of the Robin Hood story only get a mention in the later ballads. Maid Marian doesn’t make an appearance in the story until the late fifteenth century. She was almost certainly put in for romantic purposes by some wily author or printer who knew his market. He pinched her from French literature in a thieving gesture of which Robin himself would have been proud. I have put Marian in my story because I think she’s an essential part of the mythology of Sherwood. For some years there has been an historical fight over the body of Robin Hood. Should he be in Sherwood Forest during the reign of Richard the Lionheart, sometime in the 1190s? Or elsewhere, perhaps in Barnsdale near to Doncaster, during Edward II’s reign in the early 1300s? Anyone who writes stories of Robin Hood has to make a personal choice. If you’ve read this far you will see that I have chosen Sherwood in the days of Richard the Lionheart. I have two motivations for picking this period and location. The first is purely sentimental. I grew up with the idea of Robin in Sherwood, fighting the Sheriff of Nottingham and Guy of Gisborne in what was then the wild forest around Edwinstowe. The dominant culture of all those films and television programmes has sunk into my mind so deeply that I can’t imagine the outlaws being anywhere else. And I do believe that there is an argument for Robin existing long before the reign of Edward II, even if a Robert Hood gets a mention in the records of his time. J.C. Holt, in his definitive and quite excellent book Robin Hood (read the revised edition of 2011 if you are seeking it out) presents us with a number of outlaws bearing the names or rather nicknames Robinhood, or Robehod, in the 1200s, well before Edward came to the throne. Even a Robert Hod, fugitive, tried at York assizes in 1225. I’ll not delve deeper into Professor Holt’s quite superb account here. Everyone who loves the legend should read it for themselves. Holt, provably, puts the figure and legend of Robin Hood back through written sources to at least 1261-2. The argument may be made that people were so familiar with the legend or concept of Robin Hood by that time, that outlaws and highway robbers generally were being branded with his name in the court records. And such myths take a time to grow in the public imagination, decades at least, perhaps a century. Therefore, someone, somewhere, must have been the first Robin Hood. The individual whose name was then adopted by the outlaws that followed, becoming almost a title passed on down the line. As these ballads began life as oral tales, long before they were written down or the advent of printing, who is to say how they might have been altered? It is quite likely that local versions existed, promoted by a population with a good ear and memory for such ballads. And they were probably updated as they went. The King’s name of Edward in the printed versions might well have originally been Richard or John or Henry in the oral ballads. We will never know. And the versions that promote Barnsdale over Sherwood are just the survivors. People living in a very insular fashion in remote parts of England, where very few people strayed far from home, would insert their own local forest. The original ballads could as well have referred to Sherwood as much as anywhere else. And if the terminus ante quem of the Robin Hood who is mentioned in historical documents is as early as 1261-2, then it is good common sense to suggest that that individual and the other Robinhoods, Robehods, Hods, and so on, are taking these tribute names from an earlier and factual individual, who might well have been a contemporary of King John. And talking of John, Prince John is usually portrayed as an outright villain. One of the trio of baddies, with Gisborne and the Sheriff of Nottingham, who are the arch-enemies of Robin Hood. There is no doubt that John (count, in reality, not prince) could be petty, ruthless, autocratic and occasionally vicious. But he has suffered a bad press, particularly given that the histories of his time were written by churchmen who couldn’t stand him. Historically, he was no worse and often much better than many other medieval kings. I’ve tried to do him some justice. He certainly was, as I have suggested, much fonder of England than his brother Richard the Lionheart, who plundered the country to pay for his foreign ventures. John deserves an historical revision. And do I think there was an original Robin Hood, one character who lived and created a legend? My new historical novel is now available in paperback and on most eBook readers. This is a new site about the books of John Bainbridge and the world of independent publishing. We’re just starting out, so do please follow us.